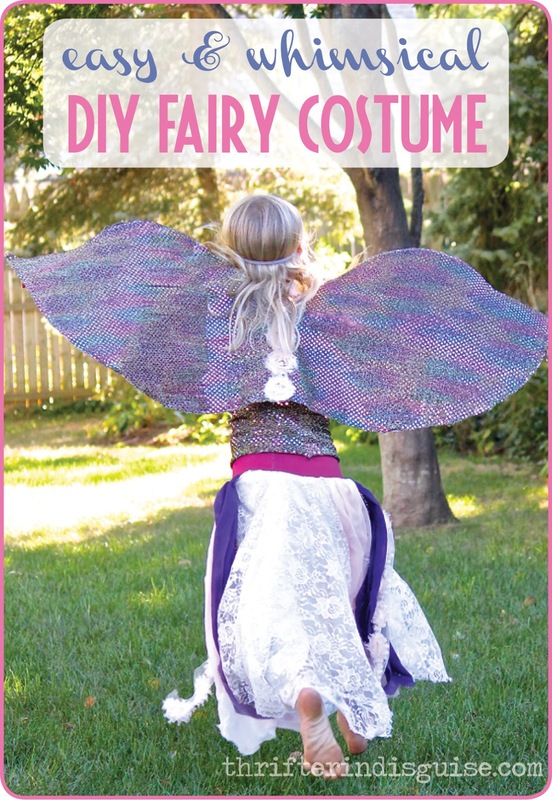 After she decided on her idea, we searched through some fairy images on Pinterest, and she declared she wanted a costume that looked like the one below. Alas. It's clearly made with techniques beyond my capabilities, so instead, I used it as my inspiration, and came up with a simpler version. FYI, this is by no means a perfect pattern, I just really made it up as I went along. 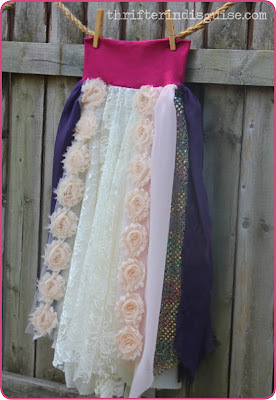 There are definitely imperfections, but as a Halloween costume or dress-up piece for play, it works. 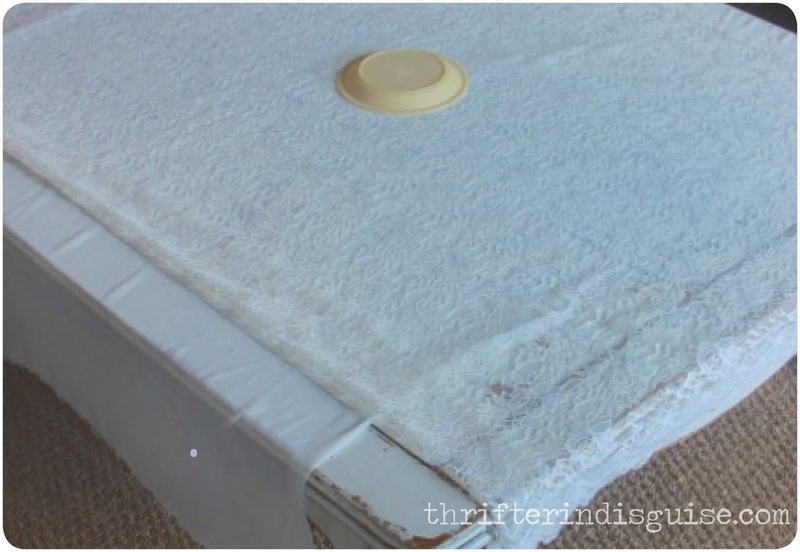 If you're making it, improvise how you like--it would look great with many different kinds of materials and fabrics, too! 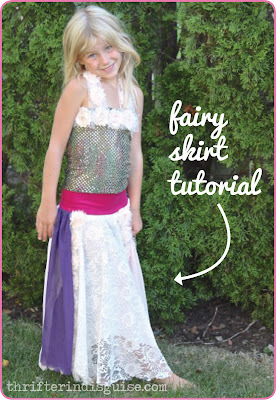 This post will give you the tutorial for SKIRT. I've followed up with the TOP and WINGS tutorial in separate posts. The skirt is easy, but it has a lot of steps, so I decided to break the other tutorials into separate posts. FYI - For the basic structure of this skirt, I used the Yoga Waistband Circle Skirt tutorial by Make It & Love It and I adapted it by adding some extra "flair." Her instructions and photos are so easy to follow and I use her site as an inspiration for a lot of my projects. 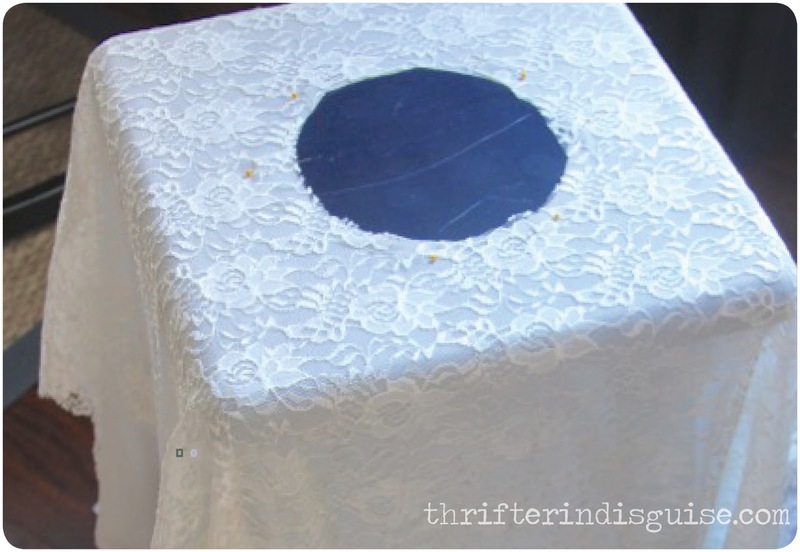 Assemble Base Layers: Lay your bottom two layers (I used the lace and the cream poly) perpendicular to each other, crossing in the middle. Cut Waist: In each piece, trace and cut out a hole that equals the circumference of your subject's waist. 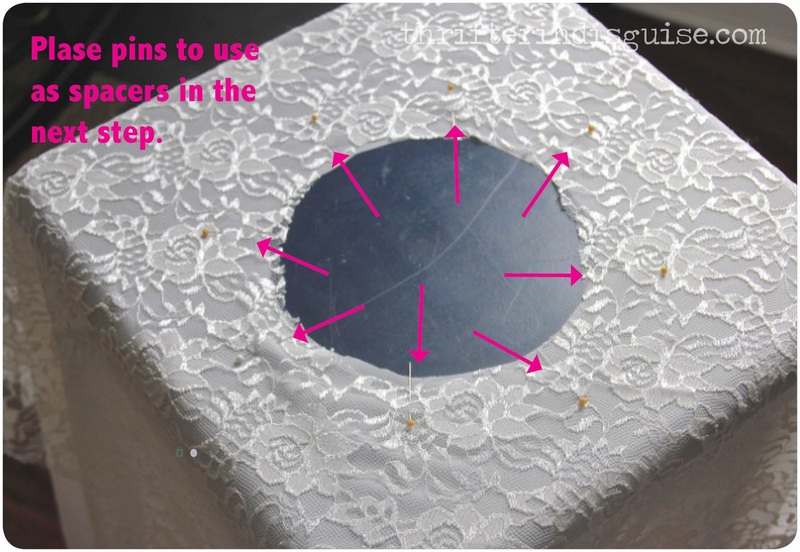 Pin Around Circle of Base Layers. I placed 8 pins evenly spread apart. 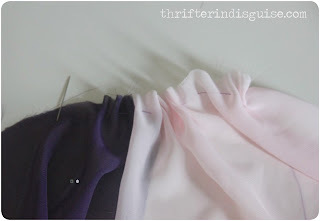 Cut Chiffon Strands, then Baste/Gather Them: I used 4 x 10" wide lengths of chiffon (two blush, two purple). 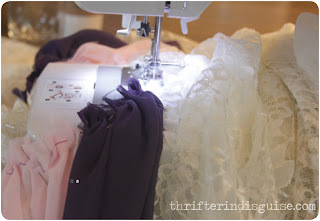 If you've got them, use pinking shears to minimize the fraying of the chiffon. Otherwise, you'll end up using a lot of fray check. 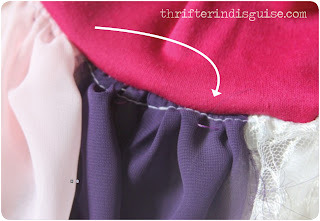 Next, Sew with needle and thread, leaving big gaps between. 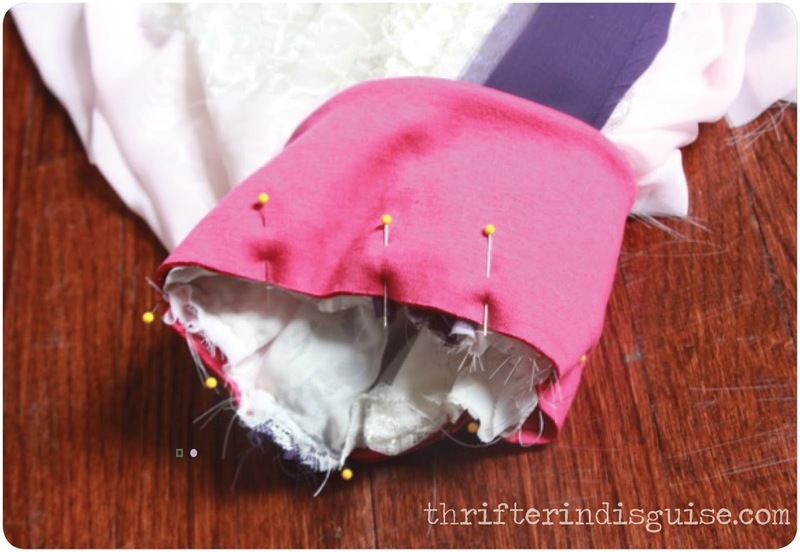 Then after you finish sewing the length, "scrunch" the fabric together evenly. Note: I didn't do this the first time around, but I should have also added lengths of the sequin fabric I used for the top. I ended up attaching it later, but it would have been easier to do it during this step. Pin Chiffon Strands to Base Layers and BASTE: Use the pins you set up earlier to set them up evenly. Hand-sew around the circumference of the circle (it's possible to do this on the machine, too, with the right settings). Sew Layers Together on Machine: I went nice and slow to be sure I got each layer with minimal snagging :) Skirt fabric is now complete! 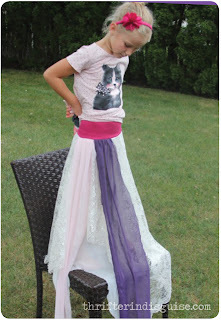 Make Waistband and Attach Skirt: Follow tutorial for Yoga Waistband Circle Skirts (follow instructions here). 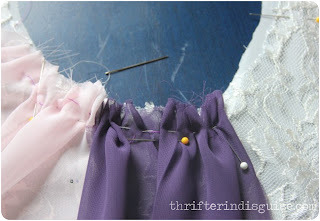 Remove Gathering and Basting Stitches: You can see mine are purple and white. Just snip them and slide them out (my white ones were too tight so they were a pain to remove!). Trim Bottom: As pretty as a long train would be, she'd be tripping over it all night, so we trimmed the skirt to floor length. 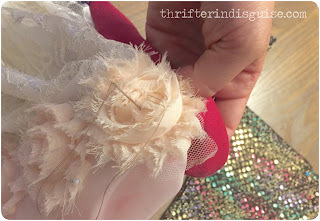 Add Desired "Accoutrements": Since I had enough of the flower ribbon left, I attached (hand-sewed) two strips to the front of the skirt. 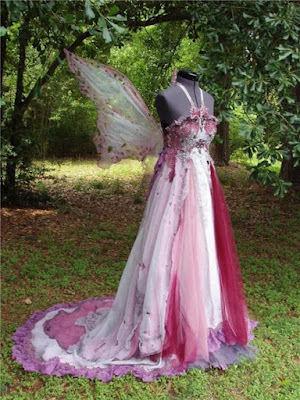 I liked that it coordinated the top with the bottom a little more. And that's it! You may want to play around with trimming it to different lengths, bu we were happy with what we came up with here. 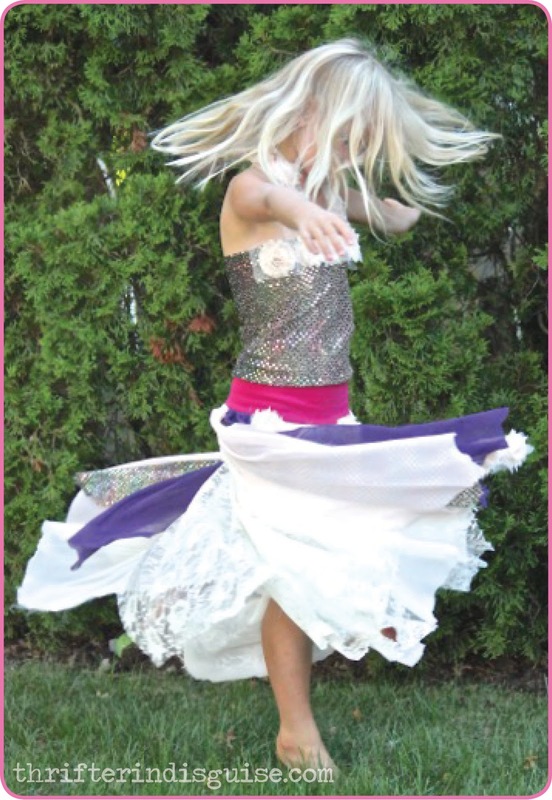 She loves how flowy and pretty it is (not to mention the fact that it's great for twirling)! Lots of fun in store for this outfit--Halloween soon--and then plenty of dress-up action after that! Want to complete the outfit? 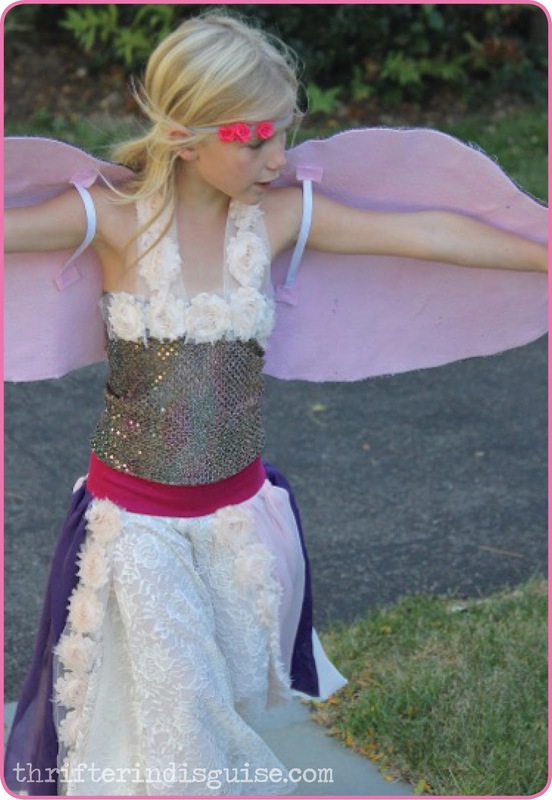 Check out the Fairy Costume Top and Fairy Costume Wings, too! For more easy Halloween ideas, check out these posts, too: DIY Witch Costumes, DIY Shark Costume.